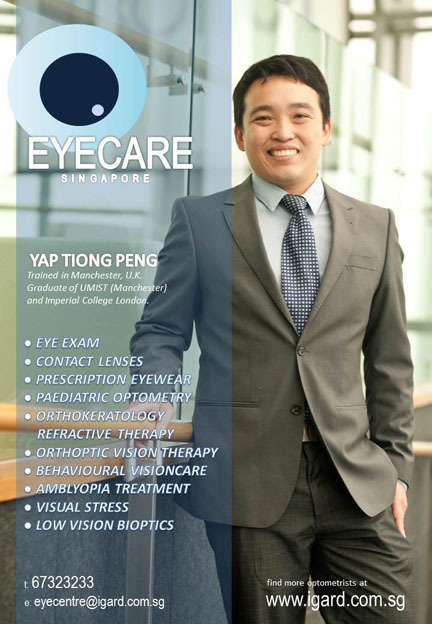 The optical service at IGARD has served Singapore for more than 10 years. Besides their routine eyewear dispensing, they offer bespoke optical dispensing services that caters towards individualized needs. Eyewear can be made and measured to the highest level of dioptric precision, but an unprecedented level of comfort could also be achieved with the use of wavefront technology in ophthalmic lenses. Although the cost of personalisation may have reduced in recent years, IGARD still maintains a wide range of affordable options. The optical service is by appointment only. A Standard Eye Examination is usually required before spectacles is dispensed. If you have already had an eye examination, please bring along the prescription. In line with good practice, IGARD offers full transparent and itemised billing of products and services. Therefore spectacles, contact lenses, eye test and other professional services will be quoted and charged separately. IGARD is very conveniently located at the heart of Singapore's shopping district - Orchard Road, which is affectionately known locally to be 'a great street' - nowhere else in Singapore is everything so conveniently available on one street! product type is best suited to meet your individual needs. If you have already had an eye examination, please bring along your latest optical prescription for a discussion or short consultation with a senior consultant optometrist. An appointment is necessary for this service so that your spectacles and/or contact lenses can be fitted professionally to maximise the performance of the optical products. A wide range of designer spectacles frames and a comprehensive range of disposable contact lenses is stocked at IGARD Orchard for your convenience, but it is also possible to pre-order your regular supply of contact lenses to avoid any unexpected stock in availability.